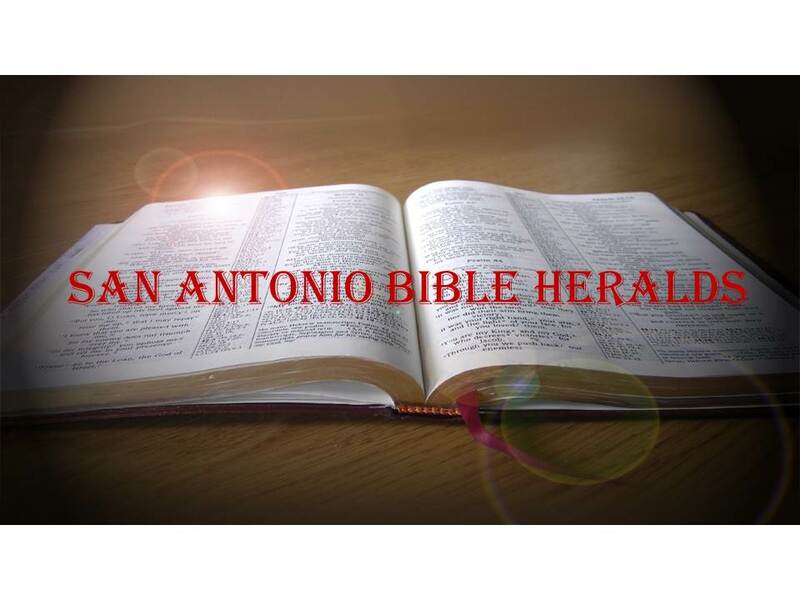 San Antonio Bible Heralds: "Let Us Go On to Maturity"
As the title of this article implies, there comes a time in the life of a Christian when he or she must decide whether the place where they’re meeting will help them become what they believe God wants them to become. Our conviction increasingly has centered on the fact that God is sovereign over his creation and that we must submit ourselves to him in all we do. I know that we Christians often speak of God being in control— “let go and let God” and the like—but what many, perhaps the majority, do not seem to understand is that God is truly, literally and in every way, in charge. That includes our salvation and even our very lives. And that is nowhere as important as it is in the field of evangelism. Although we are all aware of the charge that God has given us to reach others with the gospel, our outlook on what it means to be a Christian will have a very strong and lasting impact on what our evangelizing will be. It is essential that we learn our faith if we are to communicate it to others. Although we each have an individual responsibility to learn as much as we can on our own, if the people of God as a whole do not inculcate that hunger for evangelization to those who are the next generation, then little by little that sense of urgency will be lost. In a post-modernist world where the “whatever you want to believe is okay” philosophy is increasingly predominating, we need to be armed to confront such attitudes. GK Chesterton said once that those who become unbelievers do not become believers in nothing, they become believers in anything. If we are to counteract such thinking and if we are to combat it when it begins to make inroads in our assemblies, we can’t afford to be content with the minimum knowledge we need in order to have some vague semblance of faithfulness. A second, but very much related issue, is the role that God plays in human history. As I mentioned above, we speak of God being in control, but in our daily lives we increasingly insist on putting ourselves at the center of our lives. That begins from the very first when we assume that we control whether we believe or not or whether we will remain faithful or not. Although man has a responsibility before God, the truth that Scripture declares time and time again, is that God is the one that works in us in order for us to do his good will (Philippians 2:13). Without God’s Spirit providing what we need, we would be helpless, adrift in a sea where evil influences predominate. Let’s not kid ourselves, we cannot possibly defeat an enemy that has been around as long as Satan has. Unfortunately, to hear some say it, God couldn’t do anything without our help! That also extends to the grace of God. Far too often we have the idea that we have to somehow do all the heavy lifting in order for God to accept us. We are saved by grace, some will say, but we still have to exert all the effort in order to stay in God’s grace. Can you imagine the utter destruction that our lives would bring about if that were true? There is no way that we can stay saved without God’s supporting grace. I heard a preacher say one time that if it was up to him to remain saved, then he would lose his salvation every day! And I add that, although he may have been exaggerating for effect, he was not too far from the truth. The reality of our situation is that we depend on God for everything, from the salvation that he has brought about solely by his grace, to the spiritual sustenance that keeps us spiritually alive rather than dead as we were (Ephesians 2:1). It is imperative that we abandon the mistaken idea that to believe that God will preserve his own to the end is a license to sin. How often have you encountered those who will tell you that, if the perseverance of the saints were true, that means that we could live anyway we want and still be saved. To be fair, there are far too many who believe just that. Just recently we heard of a believer who lost her adult son. She believed that he would be in heaven because he made a profession of faith when he was a little boy. From that point on, however, he had lived with nary a thought of God or his will for his life and literally shaking his fist at the God who supposedly saved him that day years ago. But as Paul reminded the Romans “shall we continue in sin that grace may abound. God forbid!! !” (Romans 6:1). All this is to say that unless we have a true understanding of what our Christianity means, our witness and our evangelizing will mean little. It is a pyrrhic victory indeed to win many to our version of Christianity if that version is a watered down facsimile of the truth. Now, don’t get me wrong. I’m not suggesting that the Christians we have known and loved are necessarily guilty of these actions. But the direction of a body is by and large controlled by its leaders. It is the leaders who must ensure that the body is properly fed, led and motivated. 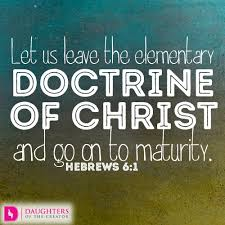 And that means moving from the basics of Christian life to the maturity that involves a deep and abiding thirst for increased knowledge and righteous living, every day! I take comfort in the fact that those who are defacto leaders at the congregation where we attended are of that mind and of that heart. Not everyone is at the same place in their Christian walk. For us, however, to fail to listen to the call that we have strongly felt would be to fail to heed the guidance of the Spirit. Our sincere desire is that those with whom we have shared these 16 months will continue to love the Lord with all their hearts and that they will seek to glorify him in all they do. The last line of the Westminster Confession of Faith says that “the chief aim of man is to glorify God and delight in him.” May we all take that admonition to heart and may our lives be a living sacrifice to the God who has rescued us from sin (Romans 12:1-2).